You got the sobering big picture last time, now it’s time for a look at the eight CRE sectors and how they fared. 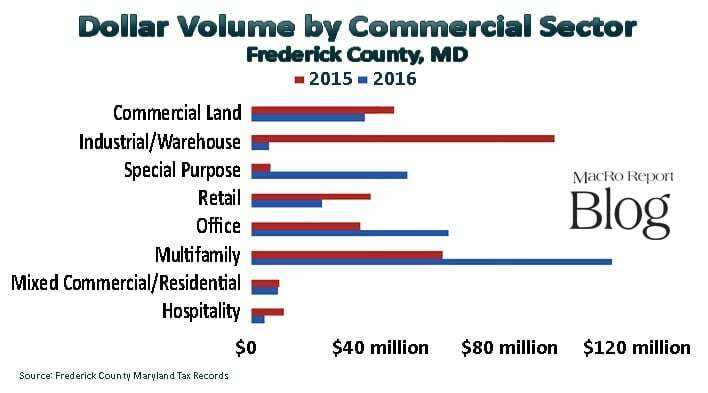 As was shown in last week’s post: A Sobering Big Picture: Frederick County 2016 Commercial Real Estate Sales Results, total sales for last year again topped the $300 million mark, but increased by a factor of 1% over 2015. However, the 132 total transactions displayed a continued and uncomfortable downward trend that began after a peak of 150 deals closed in 2013. Last year’s properties that include different uses or are zoned for such things as retail, office and residential tallied the greatest number of transactions, but 2016 saw a 35% drop to 28. On the flip side the median sales price jumped from $199,000 to $267,450, with the averages being $218,100 to $313,400 respectively. The total of $8.8 million averaged a unit size of 2,400 square feet, about 10% larger than the 2,200 SF 2015 average. Sales of industrial properties, which includes warehouses and flex industrial with office space, captured about a third of 2015’s $300 million in total volume. Seven of those deals each exceeded $5 million. By contrast, this type of transaction eluded this sector in 2016, with the largest sale being that of the Mt. Airy, Maryland 84 Lumber property in the 4th quarter at a price of $2,185,400. Even though it had 147,000 SF, we put the 807 acre sale of the former ESSROC property in Buckeystown in the commercial land sector. All in, the improved industrial sector closed five deals at $6.23 million last year, a mere 6% of the previous year. The median sales price was $357,500 at an average of 9,000 SF in size. The office sector experienced a significant increase in gross sales volume and the number of transactions over 2015 with $62,500,000 and 36, respectively. Both data-points jumped by over 70% in the succeeding twelve months. This is a very positive sign for the long fledgling office market, as can also be seen in 2016’s surge in office leasing deals. Interestingly, over one-half of all the commercial real estate sales transactions that took place in 2016 were in the office and the mixed use sectors. The number of retail property transactions fell to 80% of 2015 levels, down from 20 to 16. On top of that, the dollar value of those sales tumbled from $37.8 million to $22.5 million. The median sales price fell from $785,000 to $495,000. The average square footage in a 2016 sale was 8,400. The stark differences are found in the size of the transactions over $1 million: in 2015 the 9 sales equaling $31.3 million averaged 166,000 SF, while 2016 saw only 5 closings totaling $18.3 million with an average of 20,000 SF. The Frederick County land transfer records showed a significant jump in the number of sales of property for commercial, industrial, office, mixed use and mineral mining: 14 deals in 2015 vs. 23 in last year. With the help of the sale of the former ESSROC property in Buckeystown, Maryland, and two other deals sold by Coplay, Argos acquired 1,123 acres, bringing the total acreage sold in 2016 to 1,121 over the previous year’s figure of 146. Surprisingly, the sales volume in 2016 fell from $36 million versus $45.7 million the year prior. All this blew the record average price per acre in 2015 of $616,000 to just $32,200 last year. Apartment transactions stole the show this last year from the 2015 numbers. Last year’s $60.6 million in sales in just 11 deals was nearly doubled by the ten deals that accounted for $114 million. Two major transactions made up the bulk of volume: 297 units at Century Clearbrook at $61 million in the 3rd quarter and the sale of the 432 unit Willowdale Crossing property for $45.2 million in the 4th quarter. Three large transactions in the healthcare sector dominated the Special Purpose sector and overshadowed two small hotel transfers this past year. Overall these two sectors combined to generate over $54 million in just 9 transactions. By comparison, the grand total of $17 million took eight transactions in the hospitality and Special Purpose sectors for 2015. Was 2016 a Good Year for Frederick County CRE? Of course, the answer is yes … in the arena of total dollar volume sales stayed above the $300 million mark and the average sales transaction moved up from 2015’s $2.1 million to a respectable $2.3 million. The median sales price for bread and butter CRE sales in all sectors with the exception of Hospitality bounced between $267,500 and $495,000, a surprising balance compared to past years. Another important trend is that with a higher volume of transactions, the office market is showing signs of recovery as more confidence builds among the white collar sector of business. But it is the significant drop in the number of deals that change hands per year that may cause concern. My take is that it more than likely reflects the ending of the clearing out period of unwanted or financially burdened inventory from the recession. To that end … a good thing for commercial real estate in Frederick! Rocky Mackintosh is President of MacRo, Ltd., a Land and Commercial Real Estate firm based in Frederick, Maryland. He has been an active member of the Frederick, Maryland community for over four decades. He has served as chairman of the board of Frederick Memorial Hospital and as a member of the Frederick County Charter Board from 2010 to 2012. He currently serves as chairman of the board of Frederick Mutual Insurance Company. Established in 1843, it is one of the longest enduring businesses in Frederick County.